Conflicts over Indian mascots have been roiling over the past few days as the University of North Dakota decided to ditch the Fighting Sioux logomark. New stories frame the issue as the University buckling under pressure from the NCAA–which oversees and sanctions college athletic programs–to change the mascot. University boosters adore the logo and cling to the image like a childhood teddy bear. The Minot Daily news (online) conducted an unscientific poll where 75% of voters give the logo a thumbs up: only 9% find it offensive and 16% are indifferent. 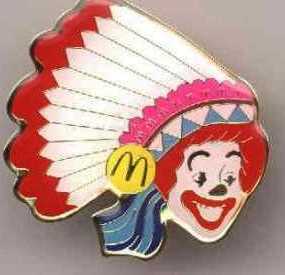 The Indian mascot issue isn’t new: As a graduate student (more than 20 years ago) I became aware that Native American groups were offended by Indian mascots. I had never given any thought to Indian imagery in this way, but began seeing the Winnebago motor home and the Cleveland Indians in a new light. I joined other writers who addressed the issue with editorials and letters-to-the-editor, and took home an award from the Native American Journalists Association for a piece I wrote scolding the Society of Professional Journalists about Indian mascots. My editorial took to task the rationale given by mascot supporters that Indians should worry about other matters, such as poverty and alcoholism. My point, however, was that Indians need to set their own agenda about what’s important. That thread runs through much of my writing. Critics continue to argue that disputes over mascots, images in film and treaty rights are somehow elastic and open to re-interpretation. For example, a recent respondent on my blog noted that Kennewick Man’s bones should be studied because “bones are bones.” You can hear similar comments about images: they are just images. But my point is that we need to reframe the perspective. It’s not about the logo; it’s about how the logo is presented and by whom. This entry was posted in authenticity, framing, Indian, journalism, Kennewick Man, Native Science, news bias and tagged Kennewick Man, literacy, rhetoric, stereotypes. Bookmark the permalink.